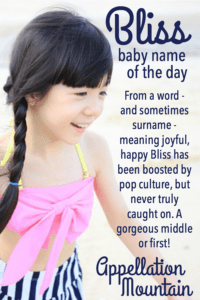 Bliss makes for an appealing word – but how would it wear as a given name? 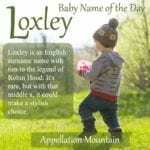 Thanks to Tawnie for suggesting our Baby Name of the Day. You’ve heard this one before. It means happiness or joy – a worthy concept for a child’s name, one shared by Felix and Felicity and a few other choices, too. It comes from the same Old English roots as Blythe. Interestingly, it’s not connected to bless – even though it’s also Old English in origin. The word implies a state of not just joy, but perfect happiness, and is used as a verb, too. Just like a tall ancestor or a dark-haired one might explain your surname, if your forebearers were happy, cheerful folk, you might answer to Mr. or Ms. Bliss. Then again, Norman names like Blay, Bleis, and de Blez and maybe Blois seem to have flattened out into Bliss in English, too. 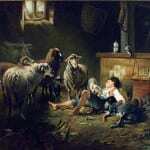 Like any surname, it can be found in small numbers as a given name. In fact, the name briefly cracked the US Top 1000 for boys way back in the 1880s. For many years, this name flew under the radar, a seldom-used family heirloom. And then came the 1980s. Dynasty spin-off The Colbys came chock full of gorgeous, unexpected names. The fictional family of the wealthy and glamorous included Fallon, Miles, Sable, Francesca, and yes, Bliss. The Colbys debuted in November 1985, and aired on ABC through March 1987 – just two seasons. Set in Los Angeles, the prime time soap opera tried to out-opulent the original. Youngest daughter Bliss Colby Rostov suffered heartbreak and family drama over the two seasons. 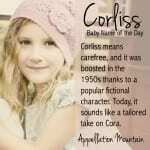 She also inspired at least some parents, because the name spiked in use during the series’ run. As The Colbys faded, so did the name. But pop culture kept it alive. Good Morning, Miss Bliss started out as the story of a teacher at a fictional Indiana junior high school, back in 1988. But you know it as Saved by the Bell. After a disappointing start, the series was revamped to focus on the students, now in high school, and relocated to California. Zack, Lisa, and Screech made the jump to the new series, but that teacher? She did not. Though you may see those original episodes with Saved by the Bell re-runs. The name’s next big moment came in 2009. Whip It told the story of a shy girl from small town Texas who joins a roller derby team. Ellen Page played Bliss Cavendish, also known as Babe Ruthless of the Hurl Scouts. Whip-It might have put the name on our radar – I guessed it would here. But the movie quietly faded. Still, it enjoyed the tiniest bump in usage following Whip-It‘s 2009 release. The name peaked in 1986, with 69 births at the height of The Colbys’ original run. By 1992, there were just ten births. A handful of minor comic book characters received the name in the 1990s, but none are enough to impact our image of the name. By 2011, that post Whip-It bump resulted in 57 girls given the name by 2011. Today, it’s trending down again, with 40 girls born in 2016. Let’s call this one rare, but wearable. It makes a gorgeous middle. And if Bess works as a given name? So might Bliss. Readers, do you think this one works as a given name? Or is it better reserved for the middle spot? I think it’s very pretty but would never use it for a baby name as you never know how much of a burden it could be to a girl who grows up to tend ro be melancholy, moody or intense. I do love the name, however. My maiden name is Bliss, and I always had pride in my last name. Growing up I always thought it would be cool on a boy. Maybe because my cousin went by Bliss, and even had the name tattooed on his back. I have thought of using it as a first name with each pregnancy. I have also thought of using the original spelling from my family line, Blysse. We ended up giving our daughter the name Lenora Bliss in 2016. I love that I was able to use my maiden name in her name, and I also love associating her with the positive vibes of “Bliss”. I still think Bliss would make an awesome first name for a boy or a girl! I also thought it would make a sweet nickname for something, and only Elizabeth came to mind … but surely there are others? I love the idea of Bliss for Elizabeth. (Or Elisabeth, to get the ‘s’ maybe?) I think it might work with nearly any B name. This is a common family name on my husband’s side, weirdly enough. I’ve often wondered if it would work as a nickname for Elizabeth. I really like this name. It would be hard to incorporate with our other children’s monikers, but it’s quite appealing.